In order to meet the growing demand of the 1.5million people in the South East of England who rely on Abberton Reservoir for their water the current capacity of 5700million gallons had to be increased by at least 50% so Essex & Suffolk Water employed Carillion Civil Engineering to carry out this mammoth 4 year task at a value of £150million. In order to achieve this increase in capacity a massive earthmoving operation had to take place and substantial sheet piling works not only for permanent retaining functions but temporary structures to enable the current pumping systems to remain operational throughout. Dew Piling were employed to supply and install approx 450t of AZ-39-700 in lengths up to 16m as a part of the design solution to enable the water level to be raised by 3.2 metres therefore increasing the overall reservoir capacity by 50% +. 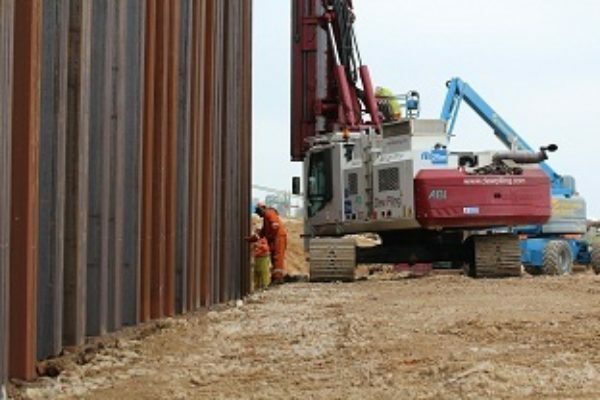 The piles were supplied in pairs from Luxembourg and driven to refusal in the stiff clays with Dew’s RTG 19m, then driven to final level with a BSP CX110 hydraulic hammer suspended from the FKL Plant crawler crane being used on site. The same methods were adopted on various temporary cofferdams installed on the contract all designed by Dew and supplied from Oldham Stock Yard then extracted at a later date. Despite challenges with high winds and very tight environmental constraints Dew completed the works on time and within tender guidelines.